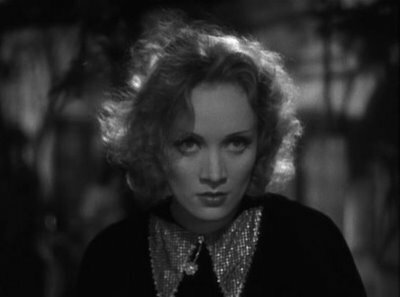 Another of the iconic women that Turner Classic Movies chose for its November "Battle of the Blondes" is the mysterious Marlene Dietrich. 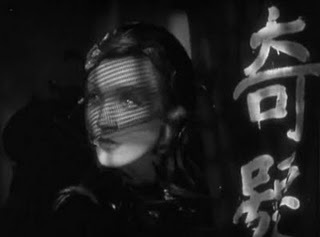 Though 1930's The Blue Angel and Morocco both launched the actress, it's really the cinematography of 1932's Shanghai Express that made her a superstar. 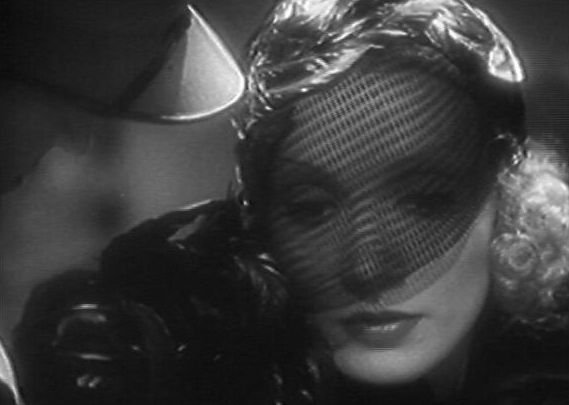 The effect was so powerful that Lee Garmes (and an assist from one of my favorites, James Wong Howe) deservedly won the Academy Award that year for Best Cinematography. 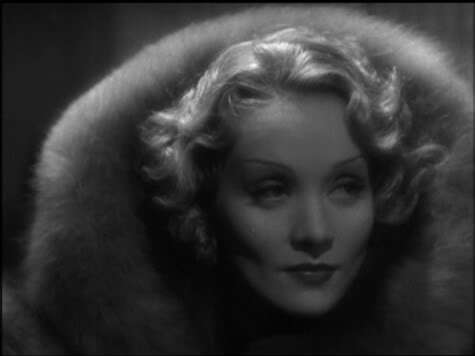 That said, Marlene later confided that the lighting was really the result of her detail driven director Josef von Sternberg. 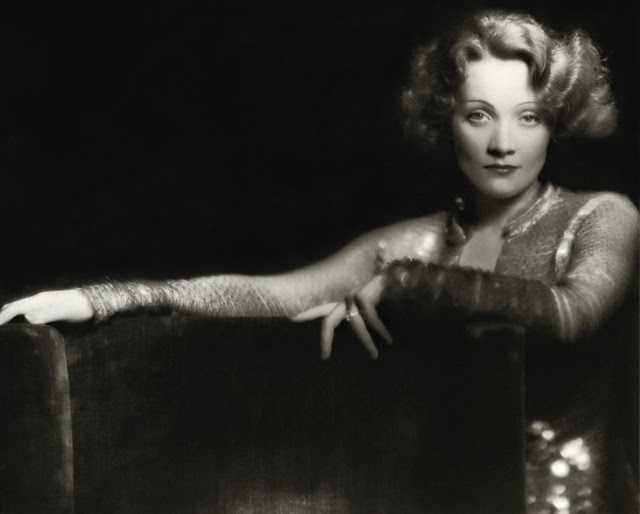 Much has been written about the relationship between Dietrich and von Sternberg, a svengali who saw her potential, plucked her from obscurity, and advised the slightly overweight German girl in the ways of the world and Hollywood. 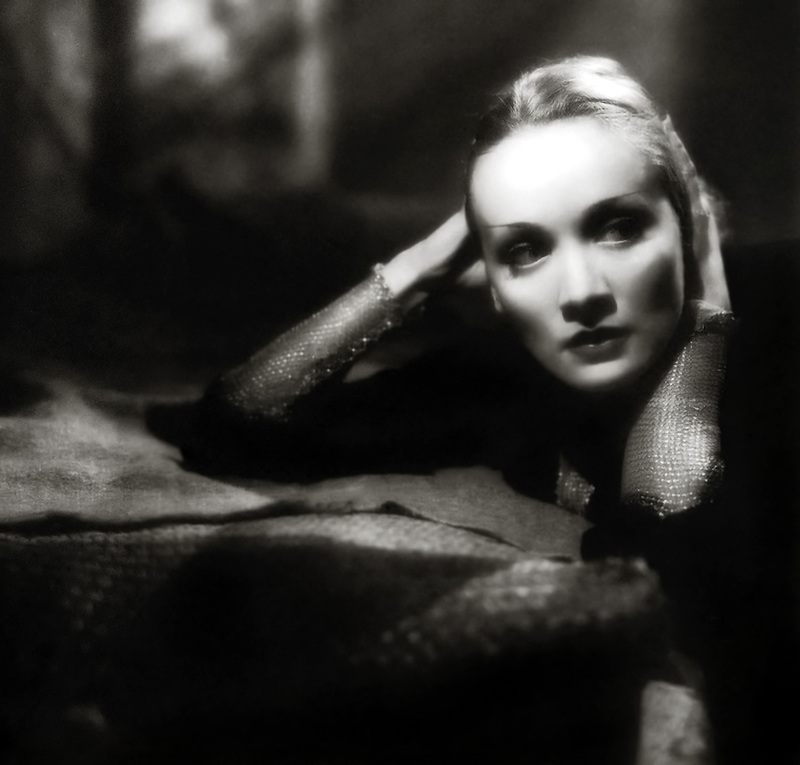 By his fourth film with Marlene, he knew just how to shoot her--using shadows even more than light to draw angles in her slightly rounded face. 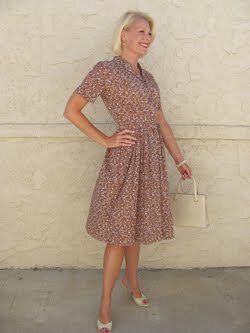 He also had her dressed to draw out her unique sultry appeal. 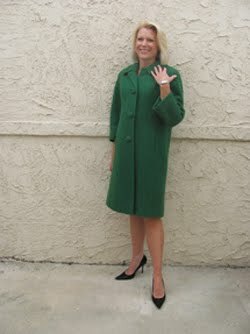 At Paramount, costumes were custom made for her by the talented Travis Banton. Marlene was now long and lean, and Banton could add whatever extravagance he wanted to his signature slinky gowns. 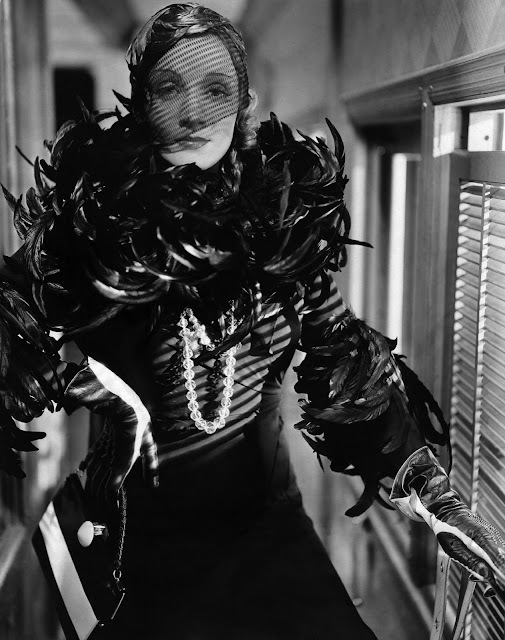 For Shanghai Express, he layered on the feathers and fur to emphasize the exotic eroticism of both leading lady and location. 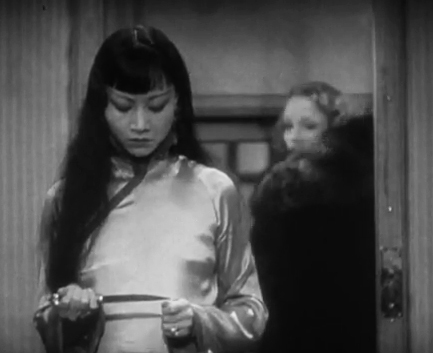 Marlene plays Magdalen, a woman aptly named who has become famous as the courtesan Shanghai Lily in 1930s China. 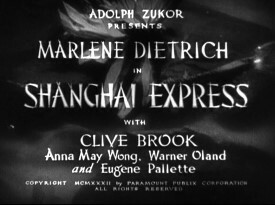 She travels on the Shanghai Express with fellow courtesan Hui Fei (Anna May Wong) while the decade's Civil War rages on outside the train. 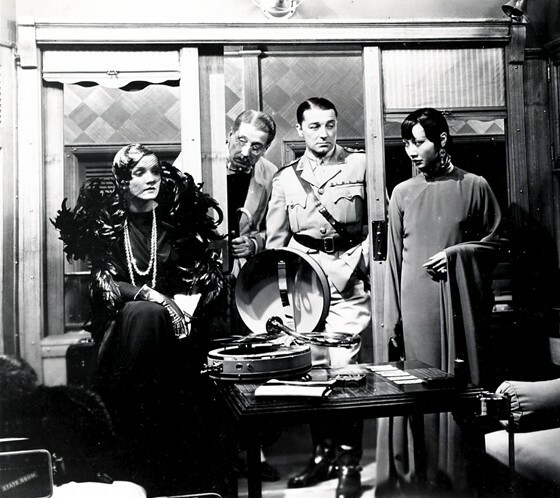 Other passengers are government officers and spies, missionaries and gamblers, and former lovers. 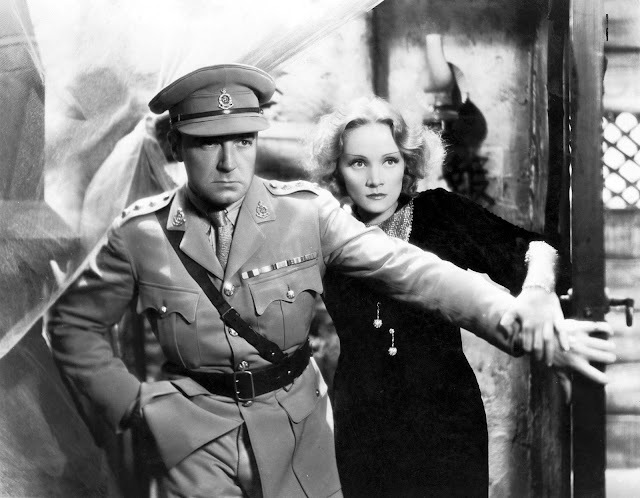 One is Captain Donald "Doc" Harvey (Clive Brook), once in love with Magdalen but who left her years ago over a misunderstanding. 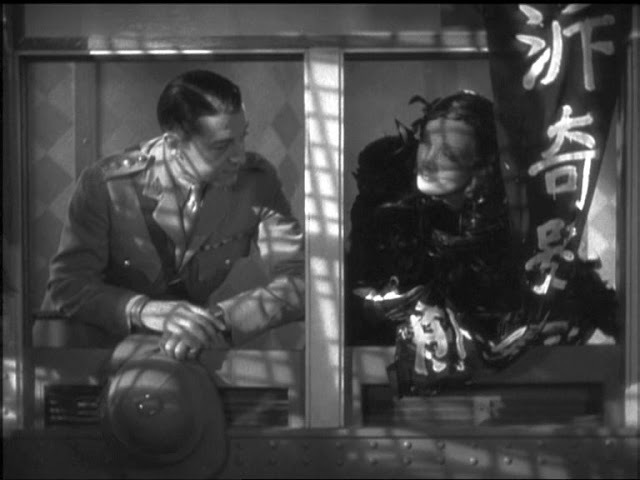 The two are clearly still in love, but try to resist their sexual tension during the travels from Peking. 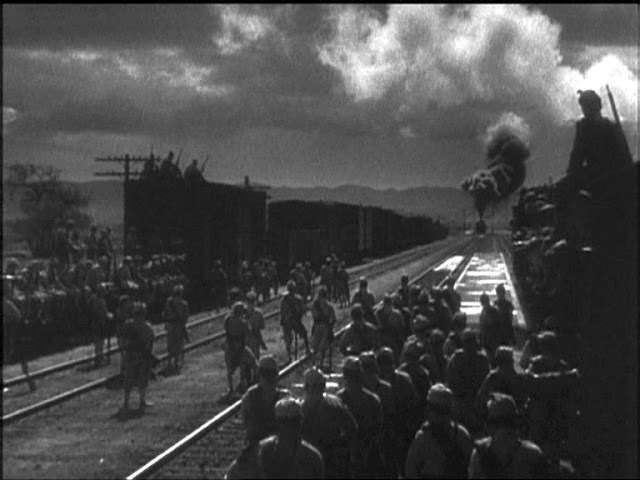 One of the most interesting aspects of the movie is how the external war mirrors the one that goes on inside the train. 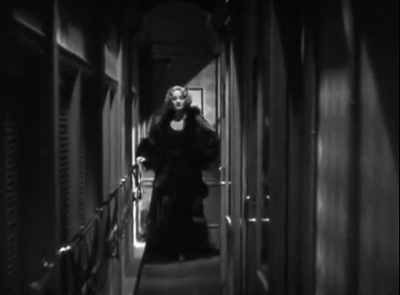 Nothing is as it seems in this very early film noir where the cinematography's light and shadows further emphasize the mysterious mood. All the elements take the audience on the journey right along with the passengers. Take the ride for yourself and see the Shanghai Express. 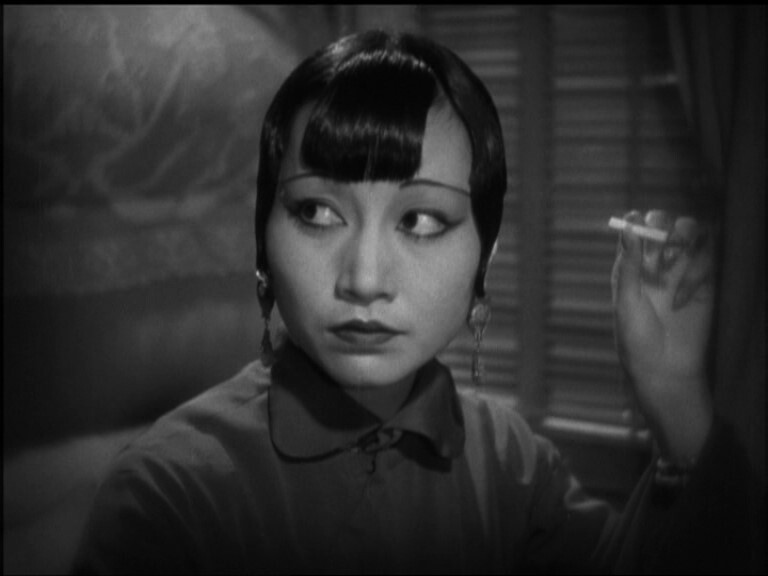 Now a famous courtesan, Magdalen tells "Doc,"
"It took more than one man to change my name to Shanghai Lily." I love this film. 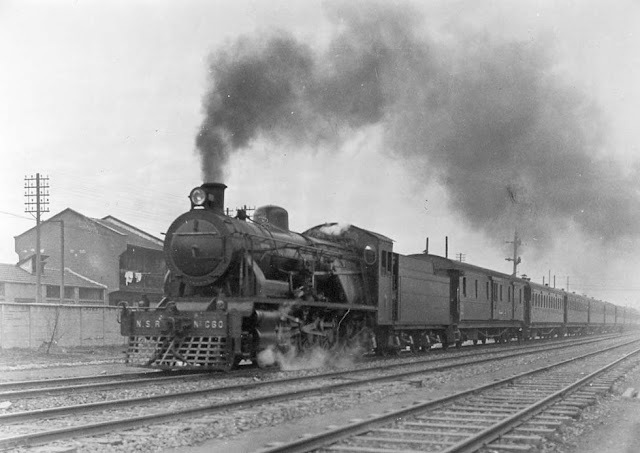 If only train travel were still so mysterious and romantic (if it ever was). I recall reading that the reason Paramount costume designers were so keen on furs was because Adolph Zukor, the studio head, had started as a furrier. All those feathers and furs - and beautiful veils - certainly add to Dietrich's glamour in this picture. Oh, Kimberly, that photo of her standing by the Venetian blinds, every kind of stripe diagonally leading the viewer's eyes all over the place...WOW! 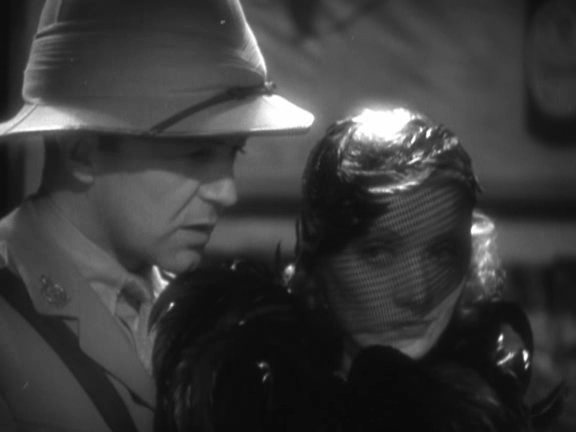 You probably know that James Wong Howe did The Thin Man and Algiers, too. He's AMAZING!!! Thanks for this wonderful post and awesome screen caps! 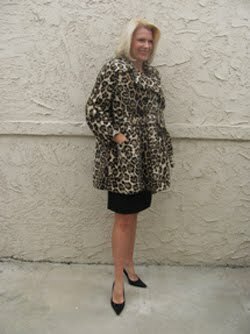 Thanks for sharing, Rosemarie! So interesting. 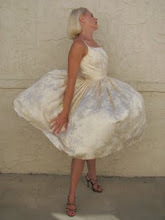 And yes, let's give a shout out to those veils as well...just so striking. 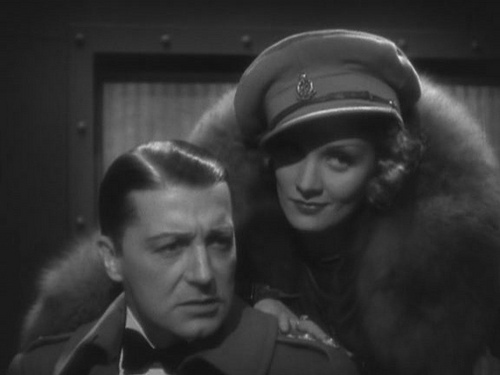 This movie is so important for showcasing those glamorous extras like the feathers and fur, and the styling doesn't seem forced at all. Great lessons here for any up and coming designers. 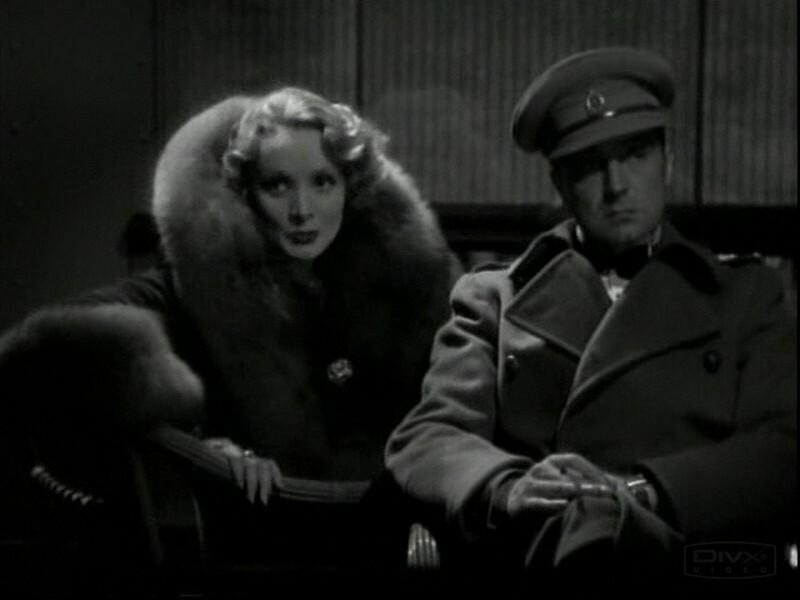 I agree, Kay, the cinematography is to die for! Don't you wish that you could have someone photographing you like that...with the blinds casting strategic shadows across your face? 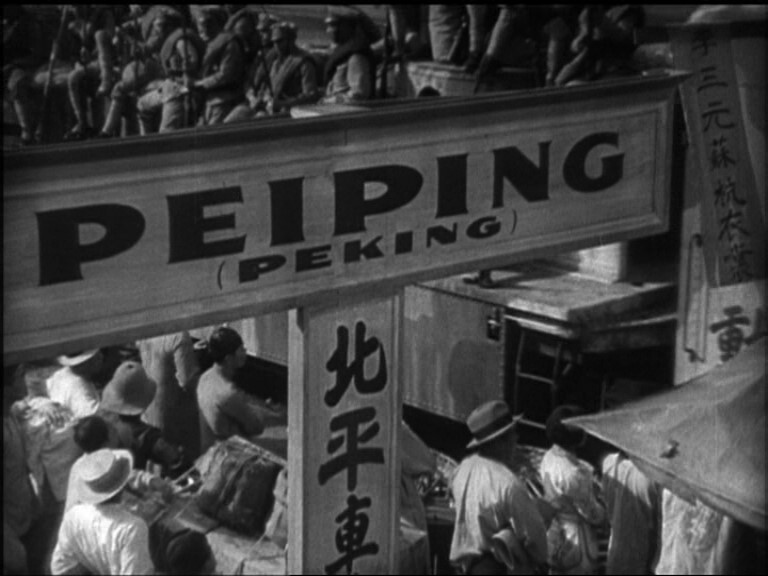 And James Wong Howe IS amazing. 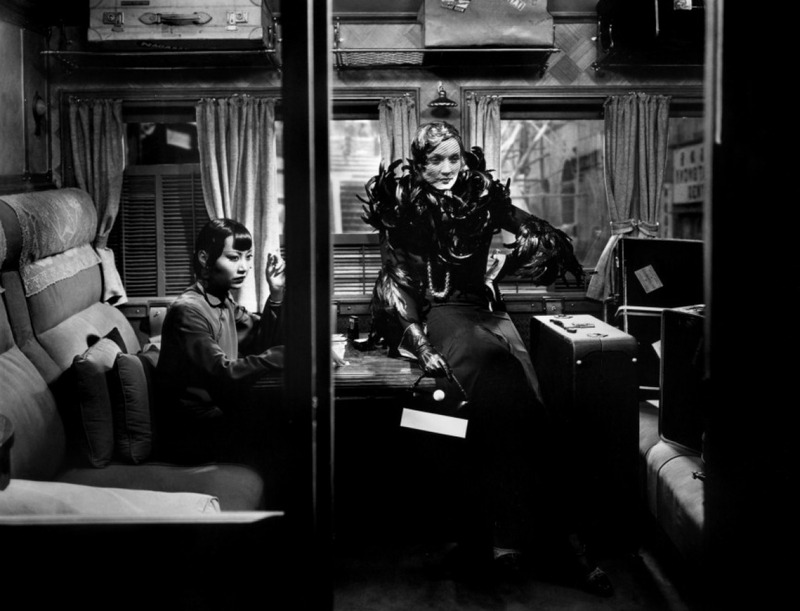 I did know that he photographed THE THIN MAN, which is one of my favorite films (and series)...so fun. My favorite lighting of his are HUD and SWEET SMELL OF SUCCESS. It's really due to his photography that you seem to be able to feel the temperature and breathe the air of each of those locations, and he really captures the mood of those movies. Just beautiful. 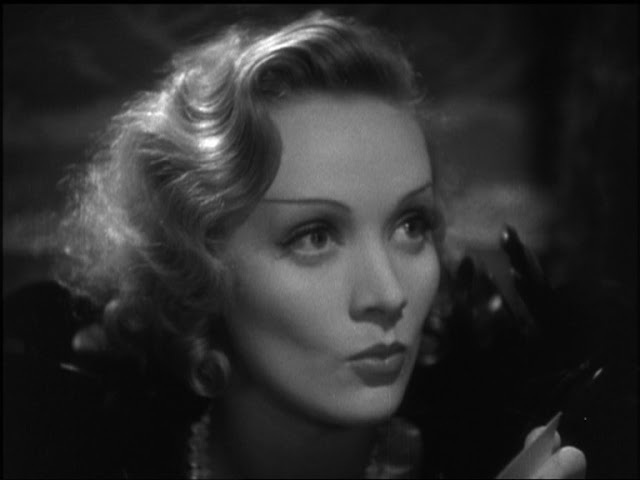 I love Marlene. I missed the movie showing on TCM though. Drats! Anyway, I love your captures. What do you use to photograph your TV? Great choices. 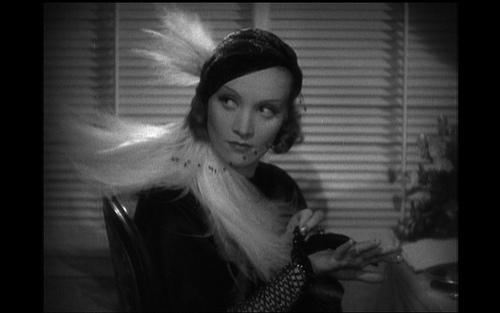 Marlene was way ahead of her time. I agree, Zen...way ahead of her time. For the Cinema Style File, most of the time I use software to do the screen grabs from DVDs playing on my computer. 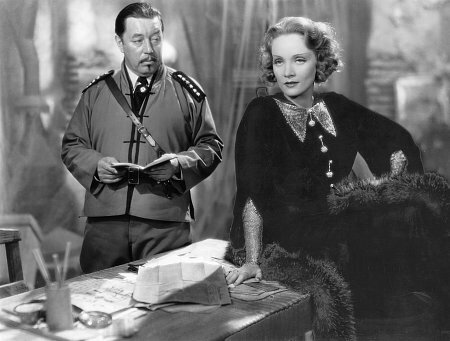 But SHANGHAI EXPRESS is not yet available on DVD. When that's the case, I spend hours culling the internet to find the types of images I want and modify them so that they work for the look and story I want to telling on GlamAmor. 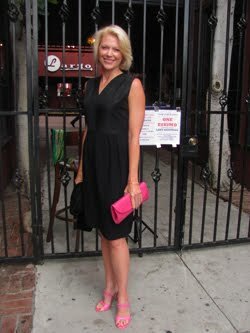 I'm so glad you enjoyed it! 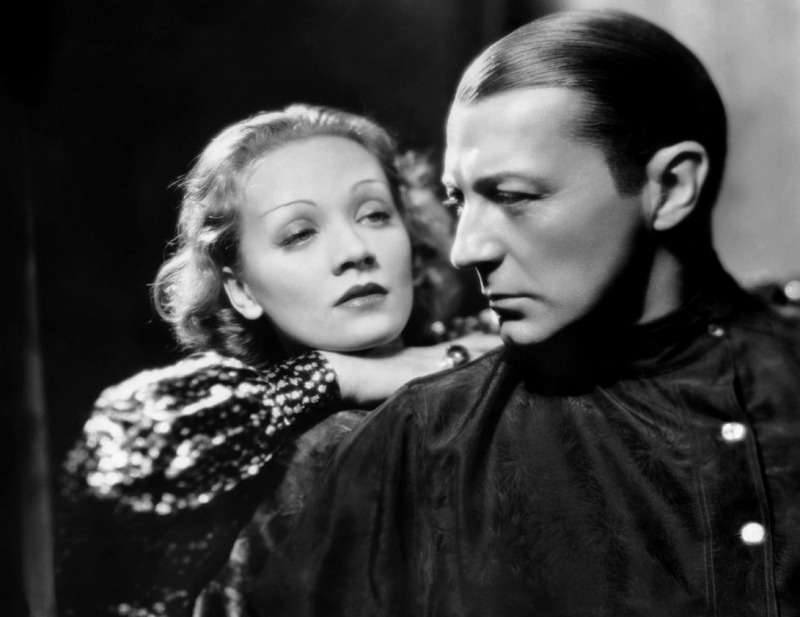 Zen, just a heads up that SHANGHAI EXPRESS is on TCM tonight...7 pm PT/10 pm ET. I know I'll be watching!